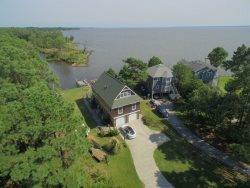 Sometimes a name says it all, and this amenity-packed 5 bedroom, 3 bath Corolla vacation rental has the locale and all the extras to make Relaxin' In The Sun an absolute breeze for vacationers of all tastes. Located in the heart of town, and wonderfully close to a number of both ocean side and sound side destinations, guests will have easy access to all the attractions that Corolla has to offer while still having their own private oasis to call home. Guests on the hunt for some fun by the water can forego the stroll to the wide secluded beaches, and cool off in their own private pool, or truly unwind in the adjacent and private hot tub that’s found nearby on the covered porch. Step inside, and the fun continues in the gracious recreation room with a TV, VCR and wet bar for easy entertaining. A kid-friendly bunk bedroom is also located nearby, as well as a convenient outside shower that’s perfect for sandy post-beach toes. The top level great room will be a favorite gathering point for everyone in the vacationing crew, thanks to a spacious great room that has ample space in the kitchen, dining and living areas. For a little natural ambiance, step outside to the sweet screened porch, or soak up the sun on the wide adjacent top level decks. With so many ways to enjoy the regional scenery, guests will find plenty of reasons to head outdoors. Boasting a wonderfully central locale in the heart of Corolla, as well as all the resort-style amenities that modern vacationers crave, this vacation retreat is a fine introduction to the good life on the OBX. Grab the crew, and start planning a vacation where you can finally devote plenty of time to Relaxin' In The Sun. Top-Level: Great room with living area, kitchen and dining room, screened porch and decks. King bedroom. Mid-Level: Queen Master suite, Queen bedroom with bath adjoining a bedroom with 2 Twins. Ground-Level: REC ROOM with TV, VCR and wet bar, along with Bunk bedroom, parking, outdoor shower, pool area. RVs, campers, trailers, and golf carts are not permitted at the property.